Watch out! #Appetizers can be nutrition disasters. You might think an appetizer would cut the amount you eat for the rest of the meal, but most research shows #starters actually increase total #calories consumed. That’s why picking the “right” starter, is important — see if you can you pick the healthier option. 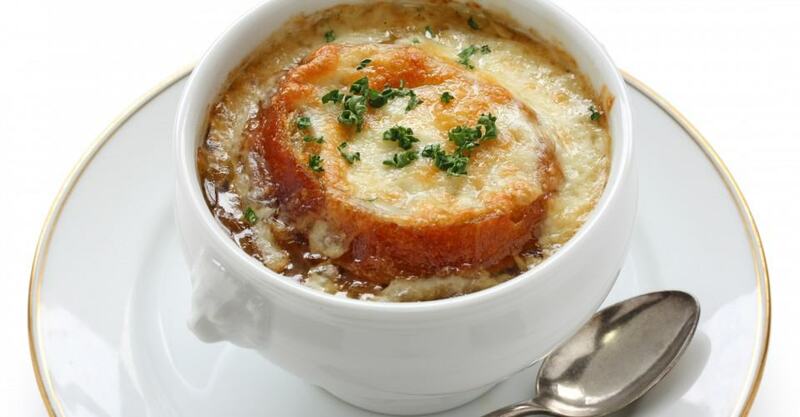 If you thought French onion soup would start your meal off healthfully, think again — this starter can have more than 500 calories. Skip the bread and cheese topping, and the soup will come in at about 100 to 200 calories per cup, depending on ingredients. A vegetable-packed minestrone soup has about 150 calories (8 ounces), which can increase by as much as 75 calories depending on the amount of pasta and Parmesan cheese. Still, compared with regular French onion, it’s healthier and has more nutrients. If you’ve learned the key words by now, you’ve probably internalized the following rule: Steamed is good, and fried is bad. But when you’re talking about calorie-packed Chinese appetizers, steamed options aren’t always a ticket to better health. First of all, consider how many you’re going to eat. Four steamed vegetable dumplings have about 300 calories — not too much less than fried veggie dumplings, which have 340. You will, however, save 4 grams of fat by switching from fried (12 grams) to steamed (8 grams). If the spring rolls are small — about 2 ounces — they are a better calorie bet at 80 to 100 calories as long as you have just one. However, watch out for the spring rolls that are the size of egg rolls, which have 250 to 300 calories each. Soup is probably the better choice, because research shows it can help decrease overall calories consumed during a meal. However, serving size makes a difference — some restaurants serve chowder in 10-ounce rather than 8-ounce bowls, which immediately adds 100 calories or so to your meal. An 8-ounce bowl of New England-style chowder comes in around 300 calories. (But watch out for Denny’s chowder, which has more than 600 calories in 8 ounces.) An average 3-ounce crab cake contains roughly 220 calories, but make sure you know how many are in one order — and how many you plan to eat — because the calories add up fast. If you love foods that are breaded and fried, you’d better learn the art of nibbling — and adopt the habit of leaving some on your plate. Otherwise, expect to polish off at least 300 (and often closer to 500) calories before the main course arrives. And that’s assuming you split these dishes with at least one other person. Those batter-dipped, deep-fried onions, such as Outback’s Bloomin’ Onion, are a calorie catastrophe. According to the Center for Science in the Public Interest, this dish has about 1,700 calories and 116 grams of fat. But there are other items to be wary of as well. Fried calamari usually comes in a hefty 3-cup serving — that’s about 1,000 calories before you even start using the mayonnaise-based dipping sauce. At 60 to 100 calories per stick, mozzarella sticks are OK only if you limit yourself to a couple — which isn’t easy when there are eight in front of you. But if you split them with a few friends, they’ll do the least damage to your #diet, plus you’ll get some calcium. Although a 10-ounce potato has only 270 calories, is filling and packed with nutrients (e.g., fiber, potassium and vitamin C) you still need to watch out for its sidekicks — sour cream, butter, bacon and cheese — which send the calories soaring to 500 or 600. Potato skins are even worse. A typical 12-ounce serving with cheese and bacon comes in at 1,100 calories and 80 grams of fat (40 grams saturated). And here’s the kicker — that’s BEFORE you add sour cream. As for french fries, well, the numbers speak for themselves — a 6-ounce order has about 500 calories and 25 grams of fat (plus the potential dangers from acrylamide). So your best bet — in fact, a #healthy option — is a baked potato topped with salsa or ketchup. Antipasto starts with a selection of deli meats, such as pepperoni, salami and prosciutto. Then throw in an assortment of olives, creamy brie cheese, deviled eggs, roasted vegetables in olive oil and a variety of crackers. The meats, cheese, olives, eggs and even vegetables are full of fat and calories. Bruschetta seems like a much better option — after all, it’s pretty much a piece of bread with some olive oil and tomatoes on top, right? Well, even though it’s made with heart-healthy olive oil and tomatoes, which contain the antioxidant lycopene, bruschetta still has loads of calories — sometimes more than 200 in a single slice. In the end, portion size is what counts. Both bruschetta and antipasto are foods we tend to lose track of while we’re nibbling. If you put them side by side in terms of calories, you will probably consume more of the antipasto. Both are good options. Although shrimp is high in cholesterol, it’s very low in unhealthy saturated fat, so it can still fit into a heart-healthy diet. Not only are shrimp and oysters low-calorie, but so is the cocktail sauce or that vinegary sauce that often comes with oysters. However, raw oysters (and raw clams) are at high risk for contamination by microorganisms, so pregnant women and those with suppressed immune systems might want to skip them. The name says it all — “foie gras” is French for “fatty liver.” One ounce comes in at more than 100 calories, and despite the fact that it’s an incredibly rich dish, most restaurants will give you at least a couple ounces. Caviar is usually a better bet at only 40 calories per tablespoon. It’s typically served with crackers or bread, which will add more calories, but it also has a very strong flavor, so you don’t need much to get your fix. Alcohol is packed with calories, and when you add mixers like soda, juice, cream or sugar — well, you could be headed for a calorie nightmare. Turning rum into a rum and Coke nearly doubles the calories; the same goes for a gin and tonic (unless you use diet tonic, which has no calories). Soda or juice adds about 100 to 150 calories per drink. So the average mixed drink contains at least 300 calories for an 8-ounce glass. And to make matters worse, a study in the “American Journal of Clinical Nutrition” reports that when people have aperitifs as opposed to water or fruit juice beforehand, meals last an average of 14 minutes longer and calorie intake is higher. Suggestions: Keep your drinks simple and on the rocks. Avoid creamy, frozen or fruity. Beer and wine are your best choices, but they still have calories. Choose light beers: Regular beer contains 150 calories a bottle, whereas light beer has 100. Low-carb beers are somewhat lower in calories than the light versions, and non-alcoholic beer is still lower at about 70 calories each. Meanwhile, 5 ounces of dry wine or champagne will only cost you 100 calories — both relatively good. Salads are the better meal starter because they have a shot at reducing your total calorie consumption. Recent research by Barbara Rolls, Ph.D., a nutrition professor at Penn State University, found that eating a low-calorie, large-volume first course, like a large low-cal salad (or soup) can enhance feelings of satisfaction and reduce total calorie intake. To avoid salad sabotage, ask for low-fat or fat-free dressing, and get it on the side. Oil and vinegar is usually one of your better choices (if nothing fat-free is available) — 3 tablespoons have 134 calories, a savings of about 100 or more calories compared with other dressings. And avoid high-calorie salad add-ons like cheese and croutons. Make a meal out of appetizers and sides. As always, avoid anything fried, creamy or served with a sauce. Look for the words “broiled” or “steamed.” And if you’re not sure how it’s prepared — ask. Soups are great if they’re not made with cream or cheese. Just watch serving sizes — we tend eat whatever’s in our bowls. Say no to butter, mayo, tartar sauce, creamy dressings or extra cheese.